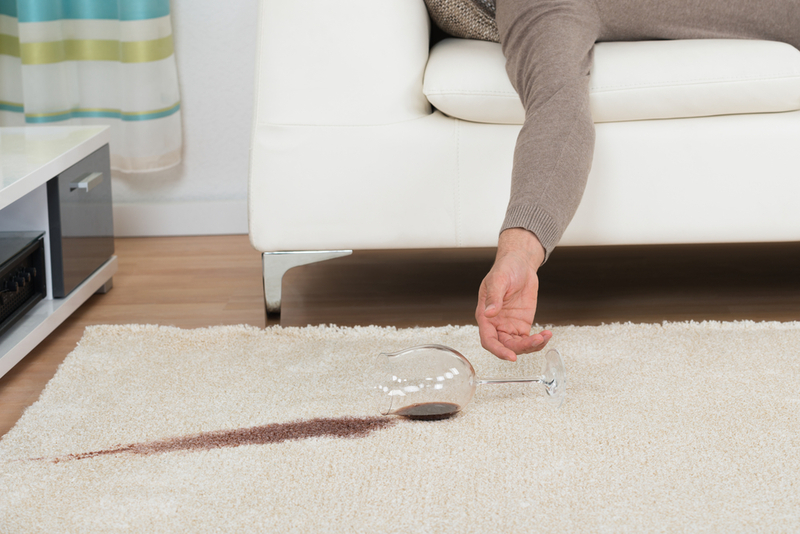 We’ve all been there: watching in slow motion as that one traitorous drop of dark red wine slips down the edge of your glass, careening towards your perfect light colored carpet. Or that time you simply got over excited and slammed your beer down on the table a little too viciously, causing it to froth and bubble all over your furniture. Whatever the cause, we won’t judge you, but don’t let this one awkward moment ruin your furniture for good. Get rid of the evidence! There are plenty of products you can buy that will successfully remove stains. But if you don’t want to spend money, there are quite a few home solutions that use everyday items from your kitchen. While chemicals such as hydrogen peroxide, rubbing alcohol, and dish detergent work, they can also cause damage to your fabrics, carpet, and wood. These simple home solutions use natural ingredients that won’t be harmful to your home and are just as effective! 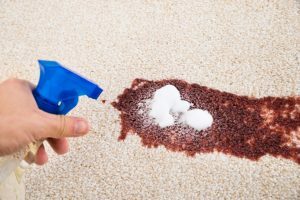 White vinegar is notoriously useful when it comes to getting out tough stains, but a concentrated amount of it could damage the dye in your clothes or carpet. To get around this, you want to dilute 1/3 cup of white vinegar in 2/3 cup of water and pour the mixture into a spray bottle (if you don’t have a spray bottle, a sponge will work as well, just be careful about pressing the mixture into the fabric too forcefully). After blotting away as much moisture as you can with a paper towel, spray the area with the mixture one or two times and then dab the liquid away. Repeat this several times until the stain is gone. Then remove any excess vinegar by applying a small amount of plain water and pressing until dry. Done correctly, there’s no way your husband will find out you’ve been drinking wine with girlfriends all day! Tough Tea or Coffee Stain? Use Your Heinie! And by “Heinie” we’re of course referring to that Heineken (or any beer for that matter) you have in your hand. Beer drinkers — Did you know that beer can actually be used to get rid of stains as well? It’s true! Coffee and tea stains react very strongly to beer. 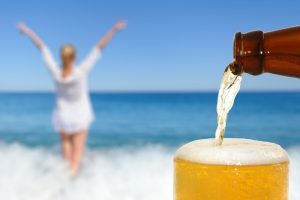 All you have to do is wait for your beer to go flat, dab it over the affected area, and then blot the moisture away with a towel. This is a great trick to use on clothing. Set some hot water to boil in a tea kettle or a pot with an easy pour edge. While waiting for it to heat up, get a wide rimmed bowl and stretch the affected fabric over the top, securing it with a rubber band so it’s taut. Once boiling, put the kettle or pot a little more than a foot above the fabric and slowly pour the water directly over the stain. Make sure you’re careful and stay out of the “splash-zone”. A few repetitions will rinse the stain out. Because it’s so good at absorbing liquid, salt is a great natural sidekick when it comes to stain removal. Luckily for us, this is especially true for furniture and carpets. First, you want to carefully blot away as much moisture as possible from the spilled wine or other tasty beverage. Once that’s done, cover the area liberally with salt and let it sit for a few minutes until the visible stain is gone. For red wine, this entails waiting until most of the red tint has been absorbed. Then simply run a vacuum over the area and whisk away all the excess salt. Now that’s some margarita magic!